Power Panel Hooks with scan plates give you the flexibility to provide customers with price or product descriptors directly on the peg hook. They are made of glass filled nylon, resist sagging and fit 1/8" B Flute corrugated. 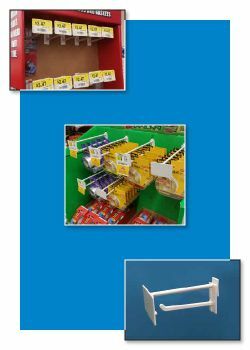 Count on Clip Strip for your merchandising material and all your display construction needs. Does your packaging require hang tabs? Please keep in mind, Clip Strip Corp. carries an extensive line of the best quality hang tabs available on the market! 4" long plastic hook with a 1-3/8” high x 2-1/8” wide scan plate. Minimum quantity for "4" Corrugated Power Panel Display Hooks with Scan Plate - Plastic, DHSP-004" is 50. 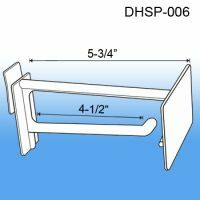 6" long hook for corrugated displays, with a 1-3/8” high x 2-1/8” wide scan plate. Minimum quantity for "6" Corrugated Power Panel Display Hooks with Scan Plate - Plastic, DHSP-006" is 50. 8" long plastic hook for corrugated, with a 1-3/8” high x 2-1/8” wide scan plate. Minimum quantity for "8" Corrugated Power Panel Display Hook with Scan Plate - Plastic, DHSP-008" is 50.